You know, sometimes I really feel like turning my back on football completely, as I’ve been known to do in the past. Football fans have always been fickle and that’s the truth, no surprise there, nothing new. It didn’t seem to work on a game-to-game basis as it now does however with the bipolar nature of many supporters in these times. It’s tiresome, immature and largely fuelled by social media the internet in general and by people who can barely spell ‘Hibs’ who really shouldn’t be left alone in charge of a computer or mobile phone. It seems we live in times where many cannot accept a defeat of any description without lashing out or finding someone to blame. It’s been a tumultuous week in the Edinburgh football world with a bad tempered and fractious clash between two age-old protagonists in Hibernian and their city rivals, Hearts in midweek. After that game many stood in support of Hibs Manager, Neil Lennon who suffered in a violent incident and who has now spoken of the greater problem surrounding that sectarian abuse in Scotland. We’ve witnessed ‘Only one Neil Lennon’, ‘in Lennon we trust’ and the usual stuff (that is quite incongruent with how he was spoken of before he took charge at Easter Road I should add) and the dubious reception he was afforded by some. Since that time he has proved his worth, ability and professionalism time after time, while Hibs in general have reached greater heights as a club than they have in many a year. Lennon is the best Manager I have witnessed at the club since Eddie Turnbull and the Famous Five legend vacated the role some thirty-eight long years ago. Attendances at Easter Road are the highest in a generation, the grand old club is buoyant, expertly and professionally run with vision and purpose and in a more healthy financial position than I can actually recall. Apparently, this is not good enough though. Below is just a fraction of the childish garbage I’ve read this evening since the final whistle sounded today. Don’t worry though, you can be certain Neil Lennon will be a football genius by the time Hibs have won their next game. The interesting thing about this shot to me is that I can instantly, without hesitation, name every single individual in that team photo, even the reserve goalie. In these times, of numerous loans, Bosmans and short term contracts we can barely even remember who played for our team the season before last. Front: Jack Wheeler (Trainer) Eric Probert, Paul Hooks, Ronnie Fenton (Manager) Brian Stubbs, Ian Scanlon, Mick Vinter. HIBS LEFT BACK, LEWIS STEVENSON’S 100% service to the Hibernian cause is celebrated tonight with a testimonial dinner. Many have quoted his unique position in being both a League Cup and Scottish Cup winner with the club and that is indeed impressive. 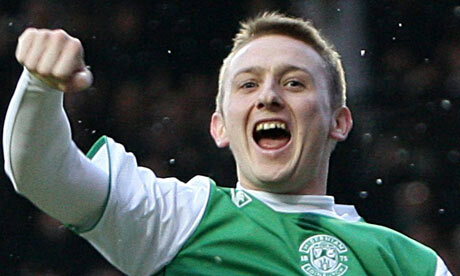 It’s a different factor that I always think of with the solid Hibs left back though. Lewis has never been a flashy or eye catching player, he is though totally dependable and fights with every breath he has for the cause in that green and white shirt. He knows that the name on the front of the jersey is more important than the one on the back. He is a modest and unassuming character which is becoming more of a rarity in professional football these days, Many times over the years he has been maligned by a section of the support. There have often been frustrating times for the team, generally, in fairness. My favourite memory of Lewis Stevenson, apart from watching him lift the Scottish Cup, was his incredibly mature and influential performance in midfield for Hibs on the day that Kilmarnock were destroyed 5-1 in the League Cup Final of 2007. He was immense that day, controlling the game to a large degree from his midfield berth, spraying passes all over the field. Just terrific. 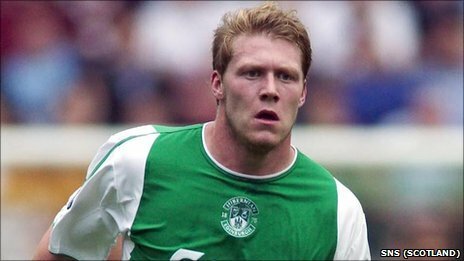 It occurs to me that, by my reckoning, Lewis has played under no less than EIGHT managers in his decade at Easter Road though. Each of those managers has realised his worth to the team and sent him over that white line to represent the only team that’s worth supporting. That will do just fine for me. Well done Lewis – here’s to many more! Around about this time of year, one of the main events that football followers look forward to is the annual introduction of the new home and away kits of their team. Sometimes these occasions are met with approval by the fan base and at other times, derision. The design of the average football club kit being such a subjective matter, it’s quite hard to gain universal approval – especially when we consider the more hard-line traditionalist opinion of perhaps more ‘mature’ generations of diehards. It already seems like months ago but back in the dog days of high summer last month, my club, Hibs, released their brand new strip for season 2014-15 to a truly cataclysmic fan reaction. One the like of I hadn’t witnessed before. 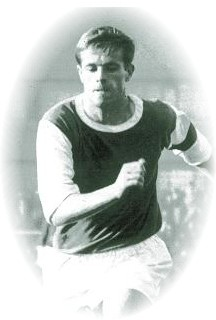 In something of a departure for the club, the famous white sleeves which have traditionally accompanied the green jersey of Hibernian for the past seventy-something years were jettisoned in favour of a late return to the much older solid green styling, using a darker shade of green as had been employed by Hibs’ earlier ‘greatest men’ of a different age. It sounds small beer when stated that way but truly, perhaps especially as so many fans had felt disenfranchisement from the Easter Road club after the dark days of a recent relegation; it produced a hurricane of protest, revilement and anger. Not quite a cold fury on the Hibs internet forums but certainly not far from it. Along with this was a fair volume of negative comment about the size and design of Hibs’ new on-shirt sponsor’s logo. A few didn’t seem to accept the fact that the red lettering of their logo is somewhat at odds sartorially with the green of Hibs and imagined that the sponsoring company’s corporate colour should be ‘changed’. That’s not going the way it works by the way, boys and girls. The club’s marketing campaign for the new kit on the official website was somewhat appealing. 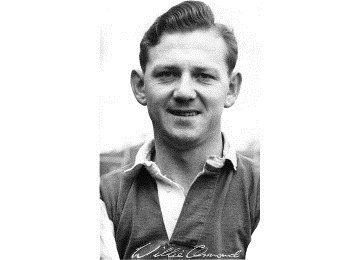 It featured attractive images of the grandchildren of Hibs’ indomitable forward line of the 1950s, the Famous Five, and focused on a small, dare I say not-very-well done inscription to Smith, Johnstone, Reilly, Turnbull and Ormond on the shirt. This however, appeared to fail to win people over. It wasn’t all about the white sleeves. The early images of the jersey made it appear cheap and shoddy looking – a ‘training top’ appearance to some – made from poor materials and based on a budget standard Nike template shirt which was something that upset many. In this way, some went as far as to see it as a defilement of the memory of the Famous Five which of course is a complete no-no – those men being held in such exalted opinion by every Hibee, even those of us who were not around in person to see them bewitch defences and dazzle the huge 1950s crowds. Something very strange then happened. A few days later the jersey actually appeared for sale in the club store on the rail and opinion began to swing to the like of ‘it’s better in the flesh than it first appeared’ type comments. Here, we can truly see the destructive power of social media and internet forums generally, in all their ferocity – and what felt like an almost complete U-turn in opinion overnight from that. It’s clear that these days, when clubs need to maximise their potential income, the number of replica jerseys sold is a highly significant figure. In this way, we see that football shirts are often designed to as much as anything look good with a pair of jeans, on the beach or in the pub – a reason why they have in some cases began to morph into t-shirts (rather like Hibs’ latest effort). Many of the comments I read referred to fans not buying one – as opposed to what the team would actually look like playing in it. This is, of course, a modern phenomenon. 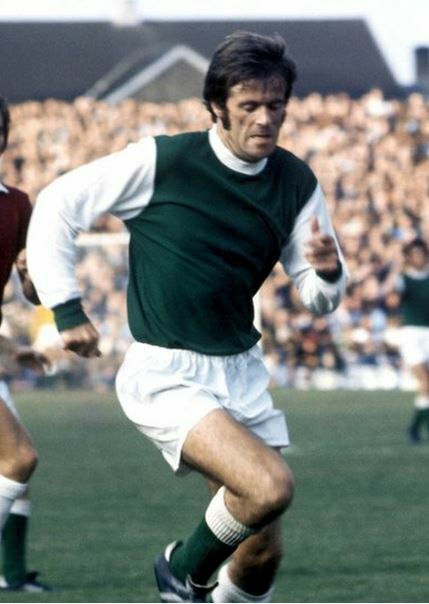 The earliest Hibs or Scotland jerseys I was able to get my muddy hands on during school days to play on local recreation grounds were pretty generic looking items, unbadged and certainly sans ‘Frew 9’ on the back. Of course this was usually de rigueur for professionals too in those days. What we always come down to after these unholy outbreaks of wrath is, of course, the bottom line. If Hibs start winning regularly in their new bottle-green ‘training top’ it will become a classic! As ever, we football fans remain the fickle ones. My own thoughts are that I don’t really like it. 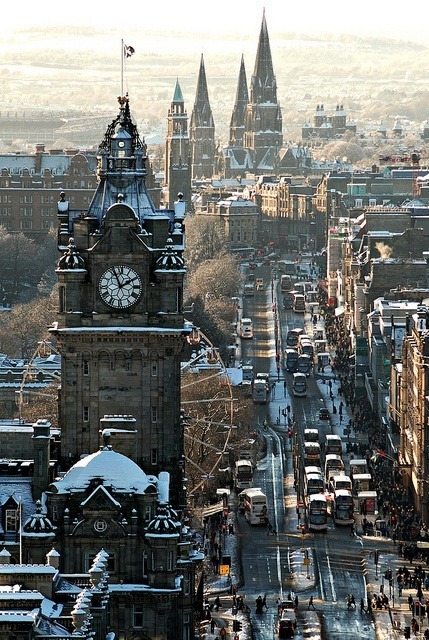 It looks neat enough but for me, it’s not ‘Hibs’. I’m not worried though as I’m aware it will be eBay fodder in around twelve months’ time, such is the way of things. Whatever it looks like, I had no intention of buying one however, my concerns are only that my club is presented appropriately and traditionally on the field of play so maybe my opinion doesn’t count for much with the hierarchy. 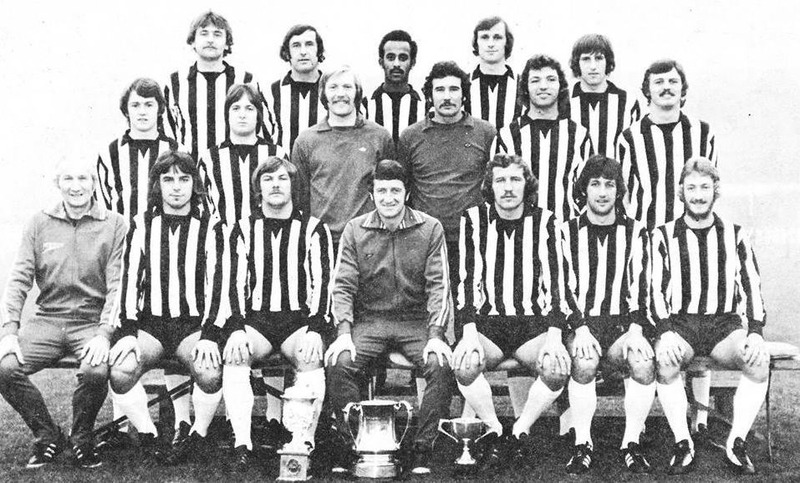 I recall one of the 1970s’ Turnbull’s Tornadoes, possibly the great Alex Cropley, stating that not only did he and his team believe they were a great side (they were) but that they knew they looked the classiest too (they did). That still has to mean something? To be proud to wear that beautiful green jersey with the crisp white sleeves and to know that you and your teammates look the business in it? Since they launched the home kit, Hibs have partly redeemed themselves (in my eyes) by the release of the club’s new away kit of white jerseys and green shorts. This strip reminds me greatly of the old tradition of reverse strips to play away from home in and, being a traditionalist, I like that very much. It even panders to the more modernist way of thinking too in that the jersey will probably go well with a pair of jeans. However, as one observer so succinctly put it, ‘I’m not paying forty-four quid for a white polo shirt with a Hibs badge on it’. It looks ‘nice on’ though as they say, well it did last night at Ibrox I thought. They certainly seemed more able than of late to find a teammate in the same colour all evening. Hibs played the second game of their pre-season programme at Berwick Rangers today – the ‘Wee Rangers’ and, as is often the case at this time of year, this was set up to be a slightly more taxing affair than the previous friendly fixture at Vale Of Leithen on Saturday of last week. I’m not sure what it is about these games but for me, apart from a very pleasant day out, they represent fresh beginnings and a renewed keenness to get back to the action after the summer break. Green shoots, indeed. So it was today with a free and easy drive down the A1, music on, sunroof open, culminated by parking up curbside adjacent Hibs’ opposition today’s home, Shielfield Park. Spotting my friends as soon I walked over the grass into the park, we headed for a drink from Berwick’s comfortable social club, taking our drinks outside into the surprisingly warm sunshine. A healthy number of Hibees had evidently travelled to enjoy the day. You see, this is the kind of thing I really miss at times. It’s not just watching the team, which is obviously the main point but the friendship and camaraderie of being amongst your ‘own’, enjoying the conversation with people who care about the same thing that you do and that understand why this club means so much. Why it is so special. I spent my afternoon with special people too – new friends and old. I don’t think I’ve ever appreciated that as much as I do now, after the trials and tribulations provided by the first half of year 2014. The doctor appeared to order it for me. 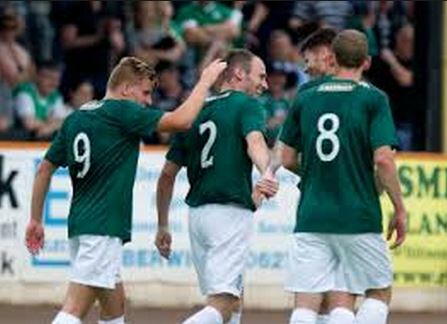 Hibs, with a good proportion of first team regulars fielded, began the game brightly in their new bottle green strip which has split opinion. It is not my choice and it looks a little unfamiliar but hey, it’s still Hibs, make no mistake. This time next year it will be consigned to the past, such is modern football, awaiting it’s day as a ‘mint condition’ item on Ebay. It is what’s in the jerseys that matters of course and the little matter of over 130 years of history won’t disappear into the ether. It will be recorded that Hibs ran out winners by four goals to nil with markers by newly signed right-back, David Gray, club captain, Liam Craig, Tom Gardiner and Lewis Allan. It’s always good to win any game but a pleasing feature of the ninety minutes was the Easter Road’s side’s willingness to play the ball along the ground, avoiding the somewhat crude style employed by Hibs’ previous management team. They’ll certainly court favour from me and a majority of fans, dare I say, if that continues. A fond farewell to friends for a few days then and a cruise back down by the rugged and spectacular coastline, back over the border into Scotland. Yes, I do let out a little cheer when I’m heading the ‘right’ way. Spotting the familiar signs for Musselburgh, my family’s home town, from the main road I decided on a short redirect through the dear old place and a stop off for a little Luca ice cream from the Olympia Cafe. You know what? Driving into the ‘Honest Toun’ I couldn’t help thinking my old dad would definitely approve of this allegiance it has been my lifetime pleasure to uphold – to Hibernian FC and yes, to Musselburgh. I couldn’t help but contrast the tough times my family knew here a century ago and me driving down the Musselburgh High Street in comfort in a shiny sports car. We are all the same though. I’m of them. He’d have been pleased to know where I was this afternoon, the people I was with and where I was afterwards. I know you’re watching, dad, I’m just keeping it in the family. Saturday 5th July and as I was coincidentally travelling through the borders of Scotland, as my team played their first pre-season fixture of 2014-15 buta few miles away. 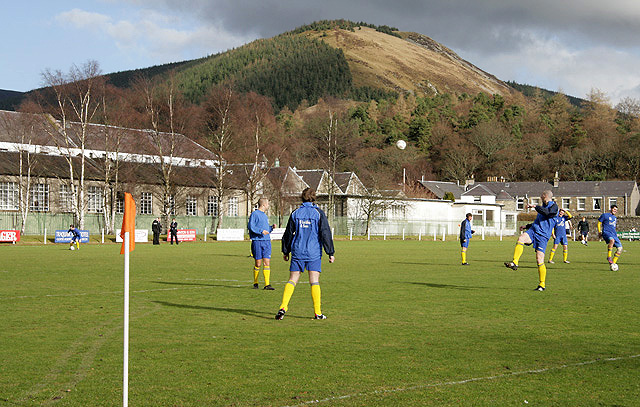 Just a point about the Hibs ‘Select XI’s victory by four goals yesterday at Vale of Leithen. Outwardly, the result doesn’t matter and on some levels that’s true. I recall sage words from Brian Clough however, who stated that maximum effort to win ALL games is the way to go. In his view, winning was habitual – it becomes a good habit – better off learnt and adhered to. In every single ‘tin pot’ game, Forest played in they were sent out to win and win well, with style. I agree with Old big ‘ed. Well done to Hibs on a positive first day back and good to see the old, established, Vale Of Leithen FC in Scotland’s pretty borders swell their funds on the day. A pleasant afternoon out too for reportedly 1,300 Hibs supporters, getting back to some ‘proper’ football after all this World Cup business! 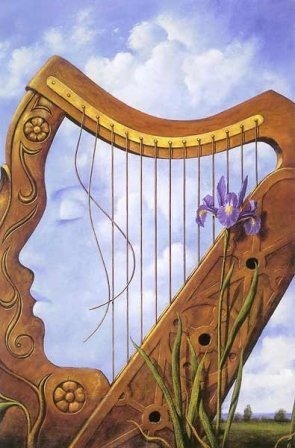 IN THE OLD IRISH TRADITION of Hibernian, a wreath of flowers in the shape of a broken harp would be presented at a funeral as a mark of respect. Yesterday’s events when, to quote the old ironic phrase, Hibs, snatched defeat from the jaws of victory, was not a funeral but was nevertheless a sad and emotional culmination of several years of struggle for the club. It’s difficult to write these word without showing anger at the catastrophic mismanagement of the team and the cl ub as a whole but in the twilight of this ignominious period in Hibernian history that anger is reverting to the familiar frustration by myself and, dare I say, a majority of the support. After angry scenes of protest outside Easter Road last evening we awoke to news that there are staff meetings scheduled at the training centre at East Mains today. Already the media informs us that no less than fourteen players are invited or ordered to end their association with Hibs. There are many fans that wished for this after one abject display after another over a series of months and who can blame them? For me though, the problem is that the man with a great shared responsibility for the club’s demise is the individual serving the ‘don’t come Monday’ messages in Manager, Terry Butcher. It’s an indication, however accurate or otherwise that he is being relied on to rebuild the Hibs – a gargantuan order that I don’t think he is fit be tasked with. Since arriving at Easter Road I cannot think of one single positive that Butcher or his cohorts Malpas and Marsella have brought to the team. There is simply nothing. They have however brought disarray, discord, indecision and a brand of football that I can only describe as ‘prehistoric’. A (the) main tactic appears to be to dumping the ball into the opposite team’s corners in an attempt to create ‘pressure’. Former Hibs and Hearts midfielder, Mikey Stewart correctly identified this mediocre thinking on Sportscene last evening and added the sentiment that it’s the type of football that ‘deserves nothing’. I am much in agreement with Stewart. 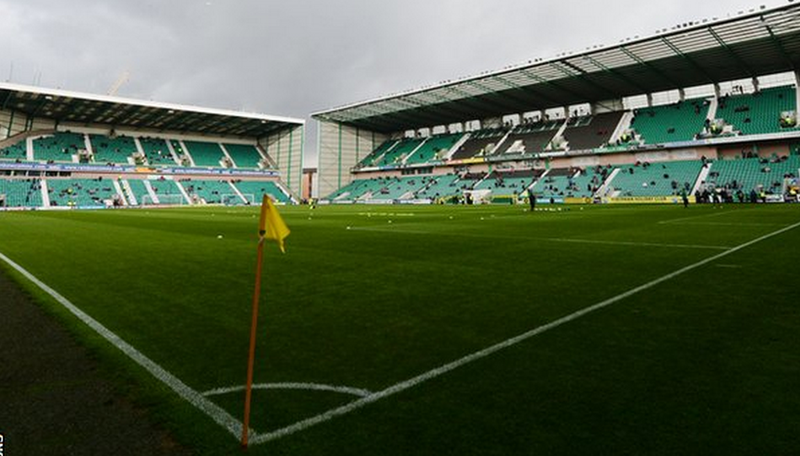 The game itself against Hamilton featured a litany of managerial errors that cost Hibs dearly. cost the team it’s SPFL status in fact, and I remain amazed that this fact isn’t recognised by Rod Petrie and his fellow board members. Those questionable decisions included not selecting the old head and steady experience of Kevin Thomson for such a fraught affair – a man who might well have brought the ball down a little and protected his teammates. Butcher also mystifyingly returned Danny Haynes to the team from nowhere to replace out of confidence youngster, Alex Harris – a strange move indeed and surely either Cairney, who can play a similar position or the aforementioned Thomson would have been superior choices. Within minutes Haynes was being helped from the pitch injured so what did Butcher do? Yes, pitch Harris back into a white-hot relegation battle. For a man who proposes to understand a little psychology and use it with his players I found this, again, mystifying. Embarrassingly, he had to substitute his substitute later in the game. One hopes that Alex hasn’t been set back too far by his treatment by Butcher in general this season. How to ruin a young player’s development. In the first leg, another youngster, Jason Cummings, happily broke his duck for the first team with a fine brace of goals. What did Butcher then do for this game? Play him further back in front of his own left-back in order that he could keep his treasured 5-4-1 formation, therefore rendering the keen young forward impotent as an offensive threat. 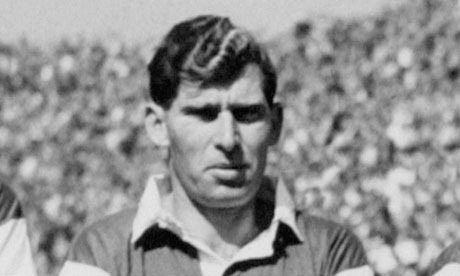 Later in the game with Hibs having formerly clearly played for a draw and now desperately playing for a 0-1 defeat, the manager pulled the experienced and intelligent play of Heffernan from the action to be replaced by his favoured defensive midfielder Tudur Jones, leaving Hibs vulnerable with little goal threat should extra time have been necessary, which it proved to be. Full marks should be given to Hamilton who played good, attractive, neat football at all times and passed it around and through their Hibs counterparts. It looked a sophisticated style when compared to Hibs’ leaden lumping of the ball forward, rendering possession to the opposition time after time. After an excruciating two periods of extra time we finally came down to the almost inevitable penalty shoot-out and here again, Butcher showed his incredible lack of know-how for a man of his experience in the game. The club’s regular and arguably best penalty taker, Craig was not chosen to take the first penalty with Thomson gamely stepping up to take responsibility for getting the team on its way. The inevitable happened, with Thomson not being a regular penalty taker. Sadly, it came down to young Cummings again to take the do or die fifth spot kick and I felt this was a huge strain on an 18-year-old youngster – unforgivable really. 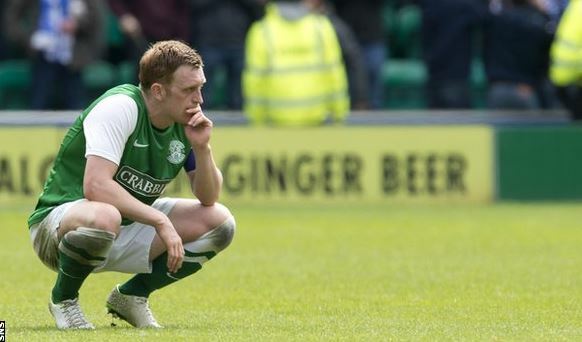 He missed his kick, hid his face in floods of tears and Hibs were relegated. What a way to hang the young man out to dry. So, the future and who knows, this piece may be out of date very quickly but it appears that at the time of writing the Butcher-Petrie axis remains with us. I have the strong feeling that the former Rangers man employs a somewhat ‘bullying’ style of management and this concerns me if so. There will always be players that can cope with that but others that cannot. That’s the way it is. I recall dear old Brian Clough at Forest terrifying some of his players at times – even to the point of the like of England international, Viv Anderson hiding under a desk when he heard Clough approaching but the big difference was that those same players had respect for their manager. I don’t think that exists with Butcher and the Hibs players. They appear to hate him and he them. The same feelings appear to surround coach, Malpas who has specialised in having run-ins with fans in the seats around the dug-out. Classy indeed. 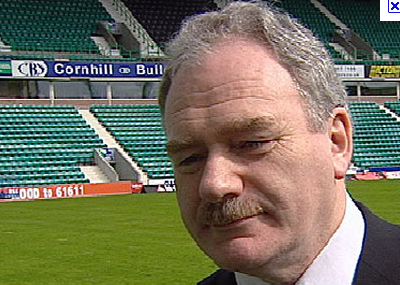 I’ve said enough regarding this sad and disturbing part of Hibs history but of course there is one man culpable more than any other who I’ve barely mentioned – Rod Petrie. I have plenty to say about him for another time as it seems we are stuck with him still – even though he has brought in the interesting character of Leeann Dempster in order to deflect flak from himself. From the club’s owner, to him and his board, the management staff and the players, all have critically underperformed. In fact the only people who haven’t are the fans. I salute them – especially the ones who can find it in themselves to continue supporting this club after one abject humiliation heaped upon another. THE ONLY THING that’s predictable about Hibernian is perhaps the team’s unpredictability and this was again shown (at long last) when taking on Hamilton Academical in the first leg of a crucial play-off decider between the Championship side and a Hibs outfit woefully short of belief and form over the past few tortuous months. Let it not be understated, the ‘Holy Grail’ of the Scottish Cup notwithstanding, this fixture and it’s second episode on Sunday are gigantic in their importance with defeat over two legs almost unthinkable. 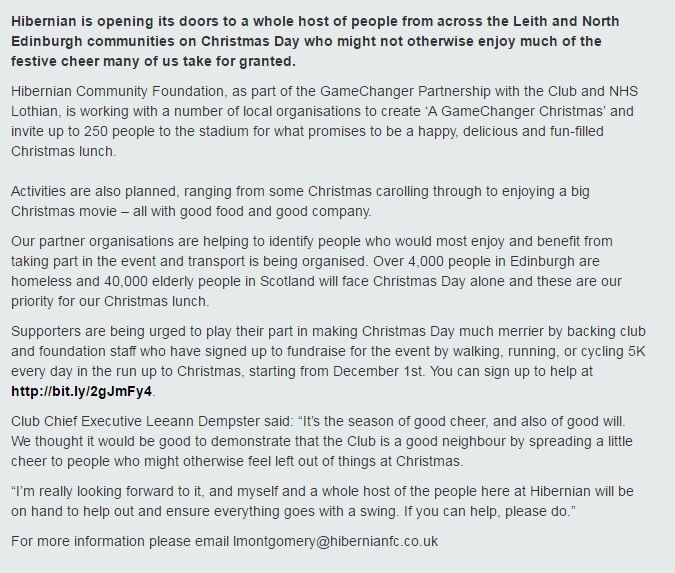 Clearly, such an outcome could set the Leith club back years – if not decades in terms of achievement and finance. ‘Absolutely crucial’ is the term dancing on my lips when considering the pivotal nature of the result. It’s recorded now, of course, that the Easter Road men finally remembered how to win again in the first leg. Heck, they recalled how to put the ball in the back of the net even. On this occasion, 18-year old Jason Cummings providing the firepower with a very welcome initial brace for the first team – something he’s promised for some little time. Well done him forgiving the whole club and it’s supporters a huge and timely lift. Personally, I was stuck at home in Nottingham whilst the drama was unfolding at New Douglas Park. I did however have the very best and most reliable internet live stream I’ve ever had in a month of Wednesdays so obviously God was looking down favourably on my oasis amidst a Hibee desert. It’s been said by many that the performance was unimportant on the night and of course this has, for once, to be agreed with. 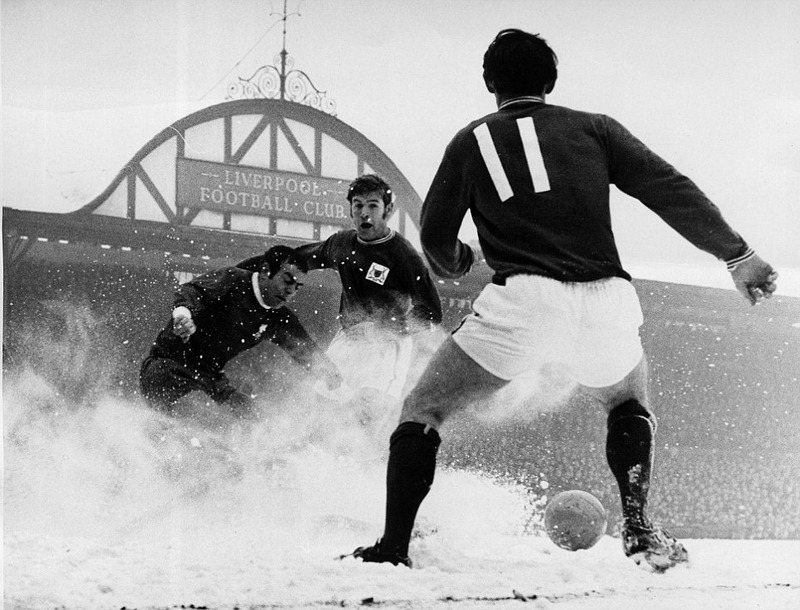 Survival in the top flight is all and playing pretty and intricate football can wait for another time. Although many of the usual failings were present and let’s be serious, those shortcomings weren’t going to dematerialise overnight, there were some positive signs visible. I thought Paul Heffernan played an excellent, intelligent striker’s role, working the channels and giving the team different offensive options than the very basic lump-it-forward stuff that we have suffered for what seems an eternity. 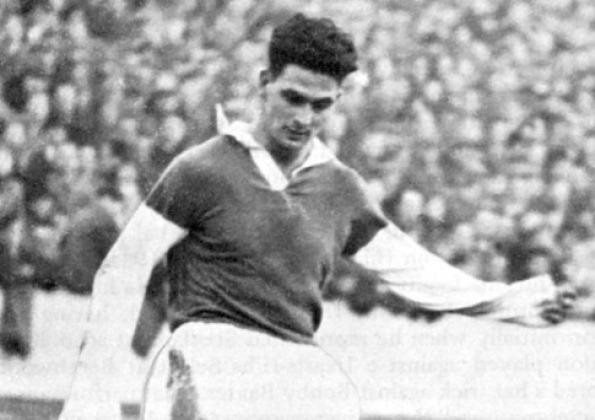 Alongside him, Cummings, apart from his two goals gave a lively, spirited performance and made himself a constant nuisance to the Hamilton rear-guard. Generally, there was a greater tempo about Hibs than in recent games, commensurate with the type of performance required on the night. As I write, the Hibernian faithful are buying up tickets fast for the second leg at dear old Easter Road. They will be our twelfth man and no disrespect to Hamilton who play some neat football, I believe they will make the difference that see Hibernian over the finish line safely and looking forward with some expectancy towards next season’s campaign and a (hopefully) new broom with fresh ideas in the shape of Leeann Dempster overseeing operations at Hibs. One last big effort lads. READING AROUND THE MESSAGE BOARDS at the moment there is much conjecture regarding the future of erstwhile Hibs striker and former Scotland internationalist, Kenny Miller. The 34-year-old former Rangers and Celtic hit man has of late been plying his trade in that most lovely of cities, Vancouver, with the Whitecaps who compete in the North American, Major League Soccer. Kenny began his professional career at Easter Road of course before a big money move to Ibrox as a young player and left the Leith faithful with a raft of good memories of his early days. 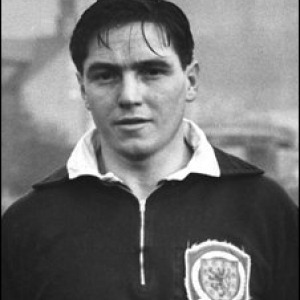 He has managed to have an excellent first class career resulting in an impressive 69 full caps for Scotland, scoring 18 goals in the dark blue jersey. Not necessarily the most potent scorer his game has been exemplified by craft and good honest hard work with no little skill. He has consistently shown his ability to play in an up-front pairing or alternatively on his own as a target man. Looking as fit and effective as ever, he scored a perfect striker’s goal against England in the last encounter in August 2013 between Scotland and the ‘auld enemy’ showing that his fitness levels, know-how and guile leading the line are by no means diminished. Sources close to him suggest that he is keen to re-join the club he began his career with and end his playing career at Easter Road. Those same sources also state that he has already offered his services on a previous occasion to the club but that these were rejected by former manager, Pat Fenlon, being supposedly well furnished with an on-fire Leigh Griffiths at the time. Media reports state that the Rangers are seeking to bring him back this side of the pond also whilst a predictable silence stagnates around any proposed move from Hibs. At a fit thirty-four years Kenny still has much to offer a club like Hibs, despite his age he is far in excess of the quality the club presently has on the books in that position and has tip-top fitness levels with at a minimum two good seasons left in him. Perhaps it could be suggested that Hibernian FC has a great deal of other issues to deal with at this current time also with the club facing a crucial two-leg play-off to retain its status in the top flight. For me however, if the club were to show a little dynamism and quick and decisive thinking in bringing Kenny back on board it would be a minor master stroke. The lift to the club and fillip to the support would be immeasurable, even without him being able to hurriedly take part in the play-offs. The fans could view a little intent to progress whilst on the pitch Kenny’s experience would also be invaluable for young players to learn from. We witness the club miss out on opportunities such as this so often due to staid and apparently over-considered thinking. I do believe it is a major reason why we find the famous old club in the dire straits it languishes in. Well, as planned, I got along to Easter Road last Saturday for one of my all-too-irregular visits. 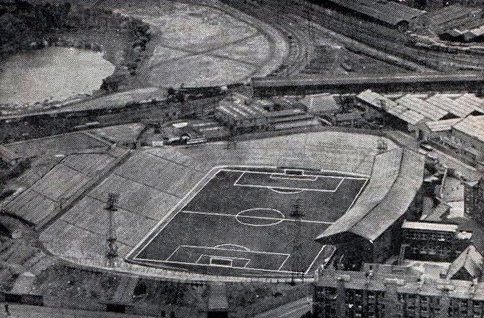 The game against fellow strugglers, Kilmarnock had built up into something of a crescendo in terms of importance, since the time I booked my modest trip to the Capital, with the loser being consigned to the indignity and frayed nerves of a play-off position for relegation to the Championship. Privately, and in spite of the odds and all indicators, I’d felt that Hibs might well come through this test but sadly it was not to be. From observing recent televised games and listening to fellow supporters, there appeared to be something of a pattern forming with the Hibs huffing and puffing to no great end before being scored on and becoming totally deflated. It didn’t take a football genius to spot the same blueprint from my lofty position in the East Stand on Saturday. It’s sad, it really is. One can see that in spite of all the team’s many shortcomings it may only take a casual slice of luck to change fortunes, a coat of paint on a goalpost, a fortunate bounce but any good fortune does indeed appear to be hiding. It was heartening to see the manager going with a little more experience in this game. I’m a great fan of youth being introduced early, but a relegation dogfight is not a good arena for a young player to learn his craft. One might opine that the more experienced members of the squad should also be charged with getting the club out of the abject mess it they placed it in. It’s probably predictable to praise or slate players but there were glaring moments when Hibs’ rearguard completely forgot their remit and stood static allowing the likes of Kris Boyd an opening for his well-taken goal. Whatever Boyd might or might not be these days I’m afraid you don’t allow him cart blanche to use his craft to find space around the box, not even for a moment. After the break it became increasingly poorer from a Hibs point of view with Kilmarnock taking control of decently long passages of the game. Craig, who showed some quality at times, rattled a heavy shot off the bar but an avalanche of fortunes never really looked on. A significant moment for me was the introduction of defensive midfielder Tudur-Jones when Hibs were haplessly chasing the game. I’ve seen reasoning that he’s good around set-pieces and that it appeared unlikely that Hibs would score from open play but I’m afraid that just won’t do for me. There was a little period a few months ago when Hibs scored from attacking a corner or two and gained a little success. Is this tactic as good as it gets though? If that’s how we are going to concentrate our offensive efforts then me might as well all go home now. Indeed, it was clear to me that Hibs had little or no method or craft in attempting to creatively carve out an opening or two. The main focus appeared to be the vain hope of getting on the end of a ball bumping and bouncing around the area. Even here Hibs are found lacking with apparently nobody seeming to relish going in where it might hurt to ram that ball in the back of the net. There has been much criticism of the team of course in the past few months and whilst accepting it wholesale my personal viewpoint is that this group of players are not as inadequate or devoid of ability as they are being decried. There is a clear lack of quality in one or two areas and the squad certainly appears dangerously unbalanced too but for me this is a mid-table quality group. They are however, completely shorn of confidence and, it has to be said, not being well marshalled by the manager. There is no method about Hibs’ play and the players at times do not appear to understand what their jobs are. They look lost and the man directing them on the bench equally, if not more so. If I were to hazard a guess – and that’s all it is – I’d say that Terry Butcher has completely run out of ideas quite some time ago. He appears dumbstruck as to what to do next with everything he knows, which sadly appears to be a little limited rather than expansive, having failed miserably. The full-time whistle blew and I honestly rarely recall feeling so absolutely gutted after ninety minutes of a football match. It was a special visit home for me this time but that wasn’t really the source of upset. It was much more to do with what this proud football club has now descended to. 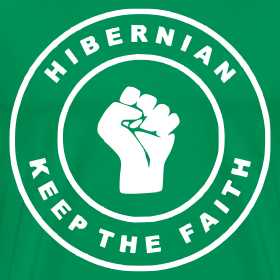 Hibs have no god-given right to success, heaven knows we understand that after all these years but the position the club is now in is just plain wrong. Mismanagement, neglect, lack of interest from above, all of these things but don’t now blame a heavily disgruntled set of supporters – even though I have recently stated my two-pen’orth on the need for us all to get behind this club in the remaining games. So, on to two legs against either Hamilton or Falkirk it is then. Characteristically, many fans have us already in the Championship before a ball is kicked. I can’t blame them, only so many beatings, disappointments and having hopes dashed can one take. Common sense and a little study of the state of play shows us that Hibs simply cannot score goals yet equally will always let goals in. They can’t do the serious business at either end of the pitch where it really counts. For me the best chance would be for Hibs to go away from home in the first leg and attack their Championship opposition, with the chance of leaving a reasonable target to achieve back at Easter Road. With the important and influential Kevin Thomson back in the side, pulling the strings, providing the ‘glue’ and fighting for the jersey I happen to believe it can still be done. Hibs need to rely on experience though and this means the inclusion of the likes of Craig, the creative threat of Cairney and the craft of Heffernan at the sharp end. If Hibs are to save their status and for this to act as a conduit to a new, brighter future for the club the seasoned professionals are going to have to stand up here and be willingly counted. ON SATURDAY 1st MARCH 2014 Notts County suffered a horrendous pounding at nearby Rotherham to the tune of six goals to nil. Dispirited and bottom of the table they have since that time shook themselves down, gathered themselves and fought together with bravery and spirit to gain six wins and a draw from their last eleven games. On this penultimate weekend before the season’s end they have pulled themselves out of the bottom four relegation places and have battled, scraped and dug deep to give themselves an excellent chance of survival with just one game to play. I have had the pleasure of witnessing a few of these games. I have also noted how Notts’ fans have fought along with them – never giving up – constantly urging them onwards, from the first till the last minute. From behind my computer in Nottingham, following the Edinburgh derby game I ‘see’ a lot of defeatism. I understand where it comes from – ‘let down’ once more – but negativity will unfortunately not help, as much as we feel it justified (and it is). There is a huge and desperate need for fans to show some unity with the club – to keep cheering the team on in the club’s hour of need. Forget for now the issues that many of us have with the people who run the club and the team (none more than me) and work together at the eleventh hour in helping this grand old football club out of this terrible mess it now finds itself in. Just like those faithful Magpies supporters have been doing. A Late Call and Hibernian Euphoria! The following article appears in the 2013 Scottish Cup Final edition of Mass Hibsteria. It was written for the Hibs fanzine shortly after the recent victory in the Edinburgh derby game. I WRITE AS A TORRENT OF HIBERNIAN green blood surges through my veins in the immediate aftermath of a famous away derby victory against ‘they who shall not be named’. A conquest made all the more sweet in that it was achieved with an injection of youthful promise, little in the way of great expectations and a terrific late, late goal by the muscular young talent of Ross Caldwell. It will be recorded that earlier in this lively affair, Hibs, after falling behind despite boasting huge territorial advantage, fought back tenaciously and levelled with yet another stunning strike from a free kick by goal machine, Leigh Griffiths before scoring for a second time at the very best juncture possible. It’s a late call for me too, writing these words at the pinnacle of publication deadline time after a kind request. The kind of contribution that is always a great pleasure as I think of my Hibernian brothers and sisters back home and indeed all over the globe. At this moment, they will variously be celebrating in Edinburgh pubs, sitting behind their computers at home like me (poring over a small avalanche of Facebook and Twitter updates and the like) or maybe even retiring to bed in the wee sma’ hours. In just two weeks time, and maybe as you read this, many of us will be reunited once more in a common cause. It falls upon me to speak of the past season, 2012-13 as we reach it’s very zenith, a somewhat extraordinary campaign in many ways. After a summer of low spirits, constitutions were thankfully fortified towards putting matters right at Easter Road. After a largely successful time achieving these aims as the winter approached, a slow, insidious (and it has to be said) perhaps slightly predictable deterioration took place. This was tempered generally by the insistent, eye-catching and dazzling success of one-man forward line, Griffiths’ attempts putting the ball in the opposition net where it belongs. Very well done to staunch and loyal Hibee, Leigh in carrying our hopes through some darker moments. Will that magical thirty-goal target be achieved, I wonder, before the final whistle sounds on 2012-13? There have, happily however, been two Hibernian FC’s as the season has drawn inexorably on. The afore-mentioned, slightly toiling league team that has left some frustration amongst us and also the excellent cup team who have fought their way to yet another opportunity to win the Scottish Cup through some difficult ties and an incredible almost once-in-a-lifetime fight back in a Hampden semi-final. This is the team I would like to focus on as I am full, yet again, of hope. The twelfth of May in this year of 2013 has left manager Fenlon and his staff with some intriguing questions to answer. I refer mainly to the belated introduction of youth into the Hibs starting line-up and regarding who shall be accommodated in the final eleven that walks out in Hibernian’s name in Glasgow at the end of May. Of late, we have witnessed the clever urgings, mature skills and intelligent football brain of Alex Harris, evidencing an overdue beginning to his senior professional career. Significant today for me too was the Ross Caldwell goal, a beautiful and clean derby strike which will perform great things for the young forward’s confidence as he begins to understand how to score for the ‘big boys’. Teenager, Jordan Forster too carried out a solid and assured debut today in this most difficult of events amidst a cauldron of Edinburgh passion. Clearly, the way forward is written, it is in youth, not the acquisition and juggling of middling, run-of-the-mill journeymen. 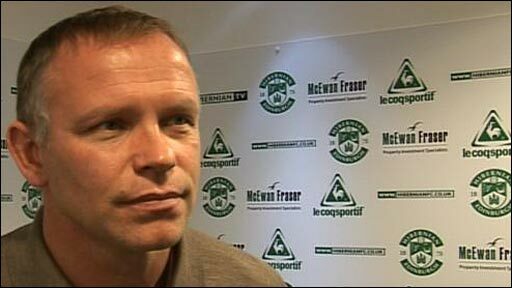 Hibernian has been and will again become a football factory of effervescent and confident young talent. I hope to see such a confidence in and parade of that talent on the twenty-sixth. I remain upbeat about the blessed institution that is Edinburgh Hibernians Here endeth today’s homily. This to me illustrates the ties of generations past and future. It is a love like no other, as I have often stated. The deep feeling, the faith, the passion and the knowing that you ‘belong’. I look forward to meeting some of you again very soon. 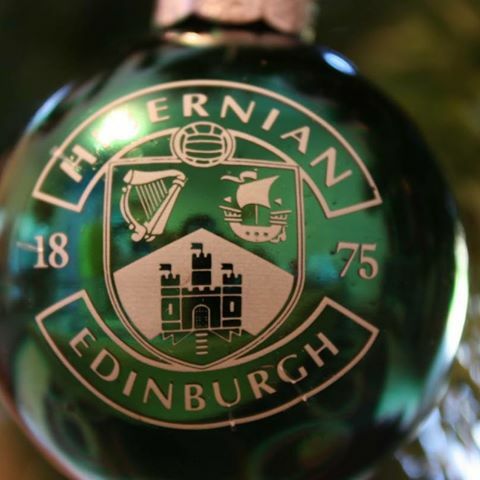 The Hibernian Football Club and its family, reaching back to 1875. Hibs: McPake or Forster for the Cup? If it’s the case that McPake is borderline ‘injured’, which is not clear, then there’s obviously a tough decision to make. Although I’m not particularly a fan of Manager Fenlon, I have some sympathy with him regarding this as he is basically on a hiding to nothing, unless Hibs win of course when all will be forgotten! You need experience in these types of games, it counts for much to have the big game mentality that having been around the block a few times can bring. You also need leaders on the park – especially if things start to go wrong. McPake, I believe brings these qualities. Forster, however, must be feeling very confident after his introduction and early promising start. There have been many examples where youngsters with ability and in his position have been trusted and have come through. ‘If you’re good enough, you’re old enough’. Brian Clough was particularly adept at plucking a youngster from obscurity and trusting them with the responsibility to perform a good job for him. I’d leave well alone. Forster has done little wrong and deserves his chance. If it’s not broken, don’t fix it, as they say. 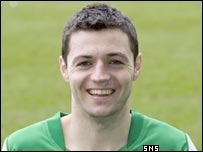 Bringing in McPake is a big risk, shame though it would be not to have his qualities out there at Hampden Park. I don’t think he is offering these qualities though currently. There are aspects of McPake’s game I’m not convinced about generally, for example his tendency to over-commit himself and his haphazard distribution, his good points tend to overshadow that though. 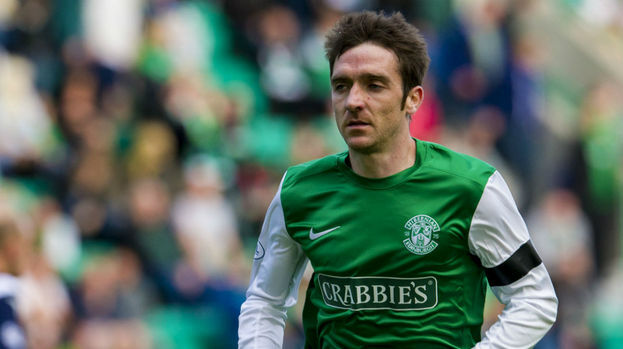 I’m not too happy about his moping around either – desperately disappointed though he must be – he is still the captain of Hibernian and has a duty to show strength, leadership and resilience – especially where younger, less experienced players are concerned. I have concerns that he is a negative influence around the squad of late. I’d like to state though that I have a large degree of sympathy for McPake. I feel his heart is in the right place where Hibs are concerned and I admire that. I think many times he has served us very well when in desperate need and I like to hope he will again – just not in the Scottish Cup Final 2013 I’m afraid. WELL, THOSE OF US OF A HIBERNIAN persuasion can breathe again. It’s the day after a tumultuous, worrying and ultimately relieving victory over First Division Falkirk by four goals to three. The unusual score line barely begins to tell the tale of the day though. After thirty minutes of the Scottish Cup semi-final at Hampden Park, Glasgow, Hibs looked completely dead and buried, three-nil down to a tigerish and eager young Falkirk team looking for the blood of an SPL scalp and finding it. Many Hibs supporters began trooping out of the ground at that point, a hail of booing erupted and the player’s heads were down. Very seldom have I witnessed such an abject forty-five-minute display by Hibs – or indeed any time. The performance was at the level of an under-12’s side. Football is a ‘funny old game’ however and what followed was quite sensational with Hibs rattling in three goals to tie the game and take it into extra-time. With the Hibees so clearly on top and Falkirk struggling to cope, the writing was visibly on the wall for Hibs’ young opponents and so it came to pass with a clinical Griffiths strike in extra-time to book his side a return journey to Glasgow for another May cup final. In spite of a famous victory there were few pass marks being handed out to players in Green and White yesterday. The great and notable exception was 18-year old Alex Harris who used the big stage to good effect in his fledgling career. Alex’ screaming goal, intelligent prompting and willingness to go forward and take people on was as refreshing as Hibs’ general (in the first half at least) display was dull, listless, artless and infuriating. Full marks go to the young winger. It’s a curious position that Hibs followers are placed in today. On the one hand, the club have reached a second consecutive Scottish Cup final and given themselves an opportunity to atone for last year’s disgraceful performance in May. On the other hand, all of the team’s glaring problems were showcased, with Manager Fenlon and his negative tactics in particular coming under great scrutiny. I’ve documented my feelings about Fenlon previously but I’d like to add that this game alters my opinion of him as a manager in no way. It is being argued today that having identified his errors yesterday he set about correcting them in the second half to good effect. That may well be true, and fair play to him on the tactical changes he made, but in my view, the turnaround came from deep down inside the players themselves. Apparently, there are rumours of dressing room fisticuffs at half-time and harsh words. It this is true then so be it. 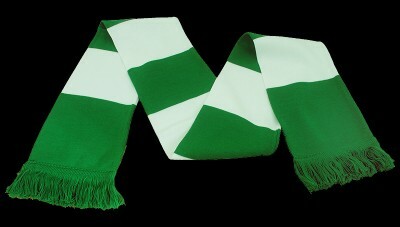 It is about time that Hibernian FC found some passion to match that of the club’s supporters which is never in doubt. Onwards to Sunday 26th of May then. Another date with destiny beckons. Glory Glory to the Hibees. I’M GOING TO OFFER an apology before I begin. I’m a remote fan of Hibernian and as I don’t don’t live within a long punt up the pitch’s distance of Easter Road, my thoughts are mainly informed by internet feeds and the odd BBC Alba game. I’m also cognisant of my fellow supporters’ views and concerns. We football supporters tend to be a slightly bi-polar bunch in present times. After a decent win the world is our oyster and everything in the garden rosy. When our team loses there tends to be a corresponding diametrically opposite view which leads directly to anger, despair and dissatisfaction. Hibs message boards can be a holocaust after a particularly bad day at the office for the team. Last evening’s Hibs v St. Johnstone clash at Easter Road was just such an occasion with an apparently very poor and weak capitulation to the tune of 3-1 to the men from McDiarmid Park, Perth. The point is I think it has come to the stage where this negative reaction is more than deserved. In the earlier part of the season, Hibs, whilst not necessarily convincing in their displays, enjoyed much enhanced results from season 2011-2012. The Hibees indeed topped the division briefly and were regularly in second spot – a great achievement considering the tragic state of affairs twelve months prior. Since that time however, there has been a long series of dismal performances, punctuated only by odd notable wins such as those against Celtic and Hearts. Over this period the Easter Road faithful appear to have become at first bored and further, increasingly restless. I need to align myself with those feelings. 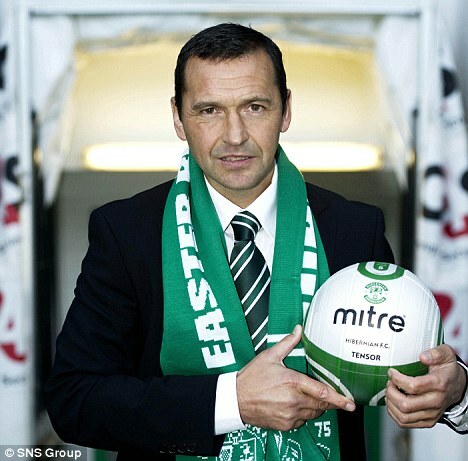 I will state here and now that i was disappointed when Hibs appointed Pat Fenlon as manager. It’s not meant as any disrespect to Pat but I felt with some conviction that after a series of managerial disasters it was time for Hibs to ‘push the boat out’ a little and attract some proven quality to the club in the manager’s hot seat. The candidate they ended up choosing was a man who had sound credentials in Ireland and a winner’s track record. Any manager has to be given time to turn things around and Hibs were certainly in a desperate state after the ‘efforts’ of Colin Calderwood’s clownish stewardship of the club. As has become expected with Hibernian there was no ‘new manager bounce’ and matters stayed firmly down-at-heel under Fenlon. Relegation threatened throughout till season end and the only polish added by a run at the Scottish Cup which ended in absolutele disaster for Hibs’ team of loanees. This season, Pat Fenlon appeared to be showing his mettle. He appeared to recognise the importance of a solid spine down the team and made some good signings in the like of goalie, Ben Williams, James McPake and so on towards that end. At first, the crowd lapped it up – why wouldn’t they after experiencing so much failure for so long. So, here we are up-to-date. For the first time I’m hearing serious claims for Fenlon’s head. I can’t profess to be surprised either. Not only have results seriously deteriorated but the fans are not being remotely entertained. Each time I watch Hibs through my available mediums I am shocked as to how little creativity they have and how lacking in ideas they seem to be. Never mind that, they don’t even do the basics correctly. Most games appear like a rearguard action by Hibs with the men in green playing deeply and defensively, inviting teams to come at them – often with inevitable consequences. The centre-backs McPake and Hanlon continually launch the ball forwards to no one in particular, with Hibs smaller, less powerful forwards struggling to make anything of this ‘service’. I find McPake – a player I have a lot of time for generally – particularly reckless in this respect. The midfield, and tellingly its incoming personnel brought in by Fenlon, has almost no significant creative passing ability. They play sideways and backwards before someone obliges with the aforementioned long, hopeful punt up the field. Just a single player of this type would be sufficient (Claros). An honourable exception to this assessment is awarded to Paul Cairney who though now seeming to have run out of steam a little has had a very good season – despite being hampered by Fenlon playing him out of position and less usefully, wide left. This brings me to another problem with Fenlon, who has a penchant for playing players away from the position they are most familiar and accomplished in. This criticism is bang up-to-date with the placing of new winger Done on the right wing he is not accustomed to. Fenlon’s tactic’s are almost non-existent. I do feel that far too much is made of tactics these days but his only plan for his team appears to be to sit back cagily and play on the break or use the long ball game with the ball hoofed down the pitch. It’s pitiful stuff – like watching a team of kids playing kick and rush – embarrassing at times. A further criticism, apart from his very negative mentality, is his abjectly poor use of substitutes. He appears not to be aware about using them tactically to change the pattern of a game and has continually used them (or not) at inappropriate times during games. This is not new as I watched Hibs huff and puff for a goal in a home Edinburgh derby last year with a rearing-to-go proven goal scorer in Garry O’Connor sitting on the bench until a very minutes to go when he could make no impression on the game. Last night alternatively, Fenlon substituted Gary Deegan just four minutes into the second half. I’m going to be charitable and say that this could be because the Irish midfielder was feeling a knock – no other reason would be satisfactory or explicable. I’m going to go for broke and say that I’m sick and tired of seeing my club play this way. I heard a well-known ex-player state the other week that Hibernian FC have never been about defensive football and I agree. Pat Fenlon’s conception of how football should be played does not even nearly coincide with my own, nor dare I say, many other fans. It is tedious, dull and dreary and is turning the fans away steadily. There is nil entertainment and it has no place at Easter Road as far as I’m concerned. 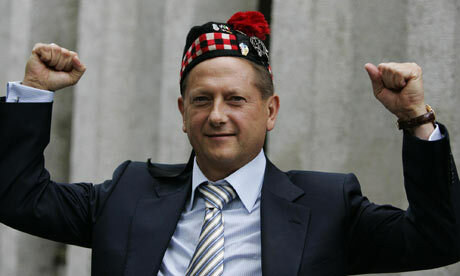 I, like many, do not enjoy the constant merry-go-round of managers that the club has invested in during recent years. I like to see a manager given a chance but at this juncture, I’d be quite happy if Pat took his notion of ‘football’ elsewhere. A recent question on the Hibees Bounce forums queried how optimistic the Easter Road faithful were feeling with just four weeks to go until the coming season is upon us. In some ways it was pleasant to see that some optimism still abounds but to temper that, I tried to imagine where that optimism is coming from? I’ll be very happy to be optimistic when there is something concrete to be optimistic about. I won’t base optimism on blind wishing and hoping. Steps forward may or may not happen over the next few weeks but until then, what I see is a requirement for an almost total rebuild of the playing squad. To balance matters, it’s great to have James McPake back and let’s be hopeful about the other two signings. It’s not all about spending money Hibs apparently do not have – I’d take an optimistic view if a few youngsters started getting a game and doing well. I understand that was difficult for Fenlon in a relegation battle last season but it’s a situation that goes further back. Hibs SERIOUSLY need the very best goalkeeper we can acquire. The question over the most important position in the team – particularly for the Hibs and the state they’re in, is long overdue being addressed. To sum up, its early days. I’m looking forward to those that run the club proving my slight cynicism, built up over a long period wrong. They have an awful long way to go to do that at the moment after the past few seasons and in particular the debacle of the whole of last season and its final capitulation. As stated previously, I’d very much like to be wrong. This club needs some different thinking – in every area – especially at the top. Sometimes it’s illuminating to look back. I found the below article that I wrote a few years ago on an early website that I created around that time. It’s now floating around in cyberspace. 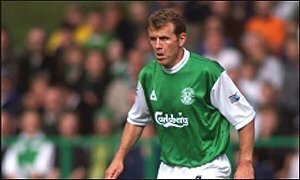 The article concerns Hibs’ Ivan Sproule who had just broken through into the side at the time after being brought into the fold by then manager, Tony Mowbray. History records that the likeable Irishman moved on the Bristol City where he exclaimed that his blood ‘would always run green’ referring to his happy time at Hibs. Ivan was eventually transferred back to Easter Road. In the sport of boxing there is a saying ‘never go back’. I’ll let the reader judge whether Ivan’s return was a success and if Ivan achieved his potential in his career. 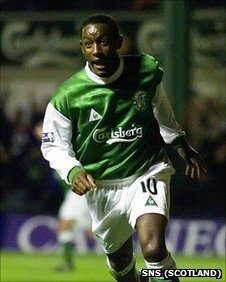 One thing I dare say, there will always be a little place in most Hibs fans hearts for Ivan and his expressed affection for the Hibs. Ivan Sproule! The name on every Hibee’s lips of late. The young Ulsterman is currently cutting a swathe through every defence that trembles in his way to goal, and what excitement he is creating for the Hibs support! The twenty-four year old former engineer, presently staking a late claim for first-class football with the Hibs is the talk of the SPL it seems so let’s take a look at this emergent talent and examine if there is a likelihood of longevity of his recent exploits. There have been many players in the game previously with huge pace and not a little trickery combined that have come along and taken a club and its league by storm and Ivan Sproule is but the latest in a long line of such players. Please make no mistake however, that is not to denigrate the young Irishman’s fine achievements over the past few weeks. Suddenly after only four recent games as a substitute it appears that Ivan’s fledgling professional career is about to explode into outer space – beware however, there are several precedents for failure. Of course it might be said that the reason previous similar players have fallen by the wayside might be due parlty to the huge expectancy placed upon the shoulders of every footballer of this kind. It becomes almost a ‘right’ of the crowd to expect that every time the ball reaches such a player’s fast feet, fireworks should occur. I sometimes muse that the game’s defenders aren’t given their rightful credit at times. How many times have we seen a young ‘wonder boy’ to coin a phrase, have an amazing initial season only to be found out and worked out by the defenders that now have the experience of dealing with this not-quite-so-new threat? Yes defenders do actually talk to each other at times despite contrary opinion, they chat about which way a player tends to move, whether he has a right foot roll, his pet tricks and all. It’s their job, it pays their mortgage. Reading this, you may suppose I’m putting rather a dampener on Ivan’s recent crusade to entertain the Hibernian faithful and what’s more make a name for himself. Not so. This boy by all accounts has something special, he has blinding pace and we all know that the modern game revolves around that quality. Speed disorientates in sport. Sometimes we see a footballer or other sportsman deceive the opposition but at a pace that the defender has time to recover. The same trickery performed at pace however can be murderous and extremely incisive. From the little footage I have been able to observe of Ivan Sproule he also possesses an even more unique skill than one to run like the wind, that of direct running, now this IS a rare commodity in today’s game and for me will be, if anything, the pivotal ability that projects Ivan into a hugely successful career. We think back to players like Paul Gascoigne and Stan Collymore who I had the pleasure of watching a few times. These players were dynamic for many reasons but the primary one was that they ran directly at defenders. Try and find a defender that enjoys being tested in this way – they’re rare indeed. What’s more, it’s terrific for us fans to watch, opening up the game and dictating the tempo the way it does. Note again however the two temperamental individuals concerned here. A psychologist’s conundrum the pair of them. The next stage for the young Irish forward will be in actually establishing himself in the first team! In all the excitement, perhaps some of us are forgetting that his recent deeds have all been as a substitute. Sometimes it’s difficult for a substitute to come on to the field and contribute meaningfully during the hurly-burly of the game, at other times the stage is set for a Sproule to dictate the outcome – just as he did so devastatingly at Ibrox recently. I’m sure the issue of a regular peg in the first team dressing room is the only one in Ivan Sproule’s mind at the moment, encouraged by manager Tony Mowbray. Time will tell if Ivan Sproule will be a five-minute wonder. My considered opinion is that he will succeed as a good honest pro. For one reason, he has a hunger for the game, he plays as though he’s in the last chance saloon to impress, perhaps indeed he is as a player coming into the professional game at a mature age. In the meanwhile Hibernian will hopefully reap the benefit. WELL, THE AFTERMATH of a tragic Scottish Cup Final display smolders on with many disaffected fans and anger raging in many supporters about the way things transpired in the national stadium – a one-sided capitulation so rarely seen. I’ll begin if I may by commenting on the Final tie – my take on events. The first thing I need to say is that after the build-up to the game which included some fine support by the Hibees’ faithful, many players in green and white completely froze on the day. This was always going to be the main problem – keeping the players focused on doing their job and performing to the best of their abilities in the game. Sadly, the occasion appeared to negatively affect too many players who just couldn’t handle the enormity of the situation and therefore provided little on the day, giving a very poor account of themselves. 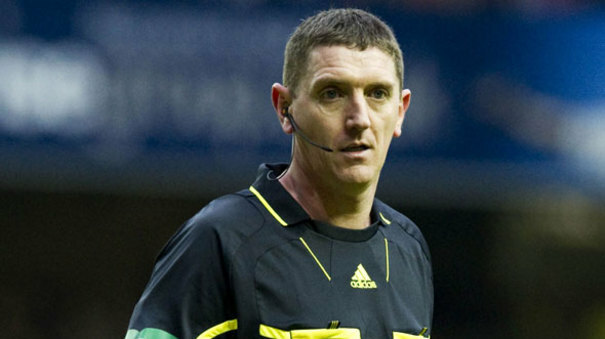 It needs also to be recorded – and those who know me would confirm that I’m very rarely critical of referees and officials in general – that the ‘small world’ of Scottish football and appointment of Craig Thomson as the man in the middle severely disadvantaged Hibs. Mr Thomson as we know has professed ‘tendencies’ toward our opposition on the day. Let’s be kind – and this is hard – and say there was no outright bias by Thomson during those ninety minutes, it must still be said though that for some reason at least two pivotal decisions by the man in black were completely inexplicable – let alone forgivable from a Hibs perspective. With the game still in its relative infancy, the opposition midfielder, Black, a combative but narky, snarling little player felled Hibs’ Griffiths with a cowardly challenge from behind featuring an elbow to the man in green’s head which completely felled the player. Thomson duly took Black to one side for what was easily arguable as a red card and after a long lecture did…absolutely nothing – effectively offering Black the opportunity to run around with impunity like a rabid dog for the rest of the game. After trailing by a couple of goals early in the game and looking a little dead in the water, Hibs staged something of a comeback with a goal which took them into the break with all to play for – ‘next goal’s the winner’ as they say. History records that within seconds of the restart the game was over as Thomson called a penalty against Hibs from a challenge by Kujabi on Suso several feet outside the area. The forward managed to spectacularly dive those final few feet into a sprawling heap in the penalty area and Thomson needed little more to blow for a spot kick and order the Hibs full back off the field. The game barely into the second half – Hibs 3-1 down and reduced to ten men – there was little way back as the game descended into a training session look-alike of a non-event. Enough, what of the future then? Perusing the Hibs forums I see amongst the anger and despair that some people are optimistic regarding the coming season. This I find remarkable considering the season the club has just had, following several other poor seasons of late. I personally like to keep a half-full glass wherever possible concerning Hibs but I’m afraid I cannot share that optimism and see little reason for it apart from blind faith, wishing and hoping. The club requires a complete overhaul at playing level and a large influx of new players with a hunger to do well, look after themselves like athletes and help the club move away from an apparent very poor culture behind the scenes. One factor that may help in this gargantuan if not impossible task is that manager Fenlon should have a few more resources available, pulled in from Hibs’ cup run and extra renewal of season tickets as a direct consequence of it. I still don’t feel this will be enough however. 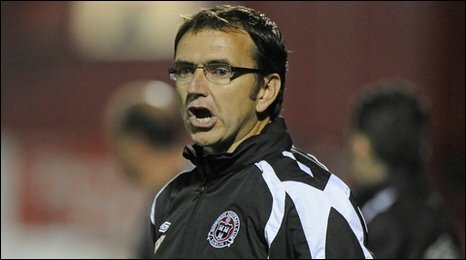 I have yet to be convinced about Pat Fenlon. In some ways, for example his strong work ethic, single-mindedness and honesty he is laudable. In other respects such as tactics, team selections and substitutions he has been found wanting and made many mistakes. He has also been almost totally unable to inspire and galvanise the players at his disposal and I have a fear that his players do not necessarily hold him in the greatest respect. This, in fairness, must partly be laid at the players’ door. I feel the task at Hibs is somewhat beyond him but I want to record that I honestly and truthfully hope that he proves me wrong. He needs a further chance to show what he can do. I saw the last Hibs managerial opening as a time when the club could state it’s intent and ambition. What was sorely needed was a ‘big’ confident personality to walk into the club and spread a little daylight and fresh air into what had become a fetid atmosphere. Delivered to the club instead by the club’s fathers was a man who was largely unknown – albeit a success in his own football world in Ireland – but yet again the ‘wrong’ type of manager for Hibs in my humble opinion. This brings me onto the thorny subject of the ownership of the club and the men placed in charge. It has been customary for more than two decades to place Sir Tom Farmer on a pedestal for ‘saving’ Hibs in those dark days when our club almost vanished forever. This was over twenty years ago however – how much longer are Hibs fans supposed to feel grateful for merely surviving? 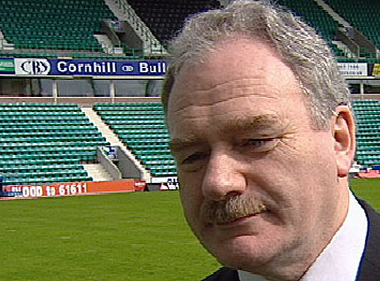 I’m of the lobby that believes Sir Tom has done his own business prospects little harm – quite the contrary – whilst holding the stewardship of Hibernian Football Club, not that I see a problem with that. I don’t necessarily go with the notion that the club is all that ‘available’ for sale. 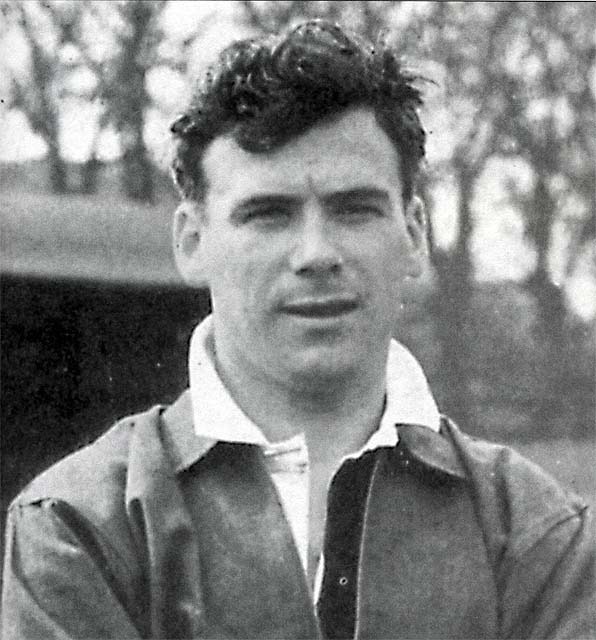 A man of Sir Tom Farmer’s huge business acumen could sell this club if he had a wish to, I believe. Mr Farmer is known as a benevolent man in some circles, my heartfelt request to him would be to at long last invest some of his vast wealth into Hibs. I’m a realist however and don’t see that happening. This finally brings me on to the subject of Sir Tom Farmer’s trusty lieutenant, CEO Rod Petrie. 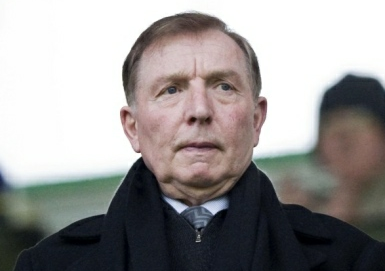 I have never seen eye-to-eye with Mr. Petrie’s ‘vision’ for Hibs. It’s a fairly miserable bean counter’s attitude which has seen the fans long-suffering. We all understand the need for financial prudence – especially in these tough times – but this penny-pinching policy appears hardly ever to be relaxed. Others will argue that point and that’s fair enough as it’s all about opinions but I still feel that Hibs are often beaten back in their pursuit of good players by a flat refusal to push the boat out just a little, whatever the financial dictates of the era are. Time and again Hibs are too cautious and it has resulted in a blandness about the club which does not reflect a colourful, imaginative and oft romantic support This is one of the many reasons I have little optimism for Hibs in the near future. Sights are set too low and sadly, it has to be said, some fans’ expectations have fallen into line with that over the years. Hibs are truly a club that underperforms consistently and attitudes amongst all need to be seriously challenged. 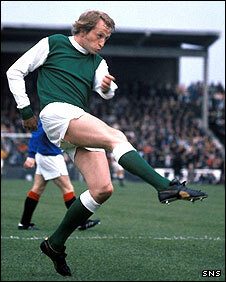 Until that time, I’ll keep supporting Hibs as I’ve always done – hoping for the best – fearing the worst. ‘Glory Glory to the HIbee’ – at long last please? It’s the day before catching the train back to Edinburgh for the Scottish Cup Final between Hibs and Hearts. I’m putting a few things in a bag – or trying to – I’ve been so distracted all week and hardly able to concentrate on anything bar this momentous occasion. After a lifetime of following Hibs, this is the most important game of them all. It’s a mixture of emotions, pride, tension, joy, fear and everything in-between. To my friends: ‘Good luck’. To my ancestors: ‘You walk with me’. Have a few Hibs Heroes. 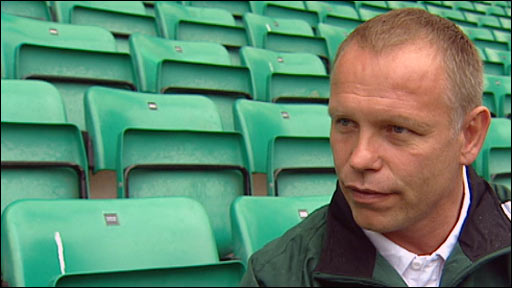 It’s taken a little time in happening, as we knew it would, but Hibernian have finally settled on a new man at the helm to replace former boss, John Hughes. The usual cloak and dagger juncture that we anticipate from Easter Road in these circumstances has been a feature of the operation with few fans or media correctly guessing at Calderwood, at least until the very last day or so. These times are always interesting of course and we are told that as many as 105 individuals have applied for a job which some see as something of a poisoned chalice of late. It is unfortunate to see that Easter Road has, like many other clubs, become something of a graveyard for managers in the past few seasons. Since the relatively successful and hugely entertaining tenure of Tony Mowbray, Chairman Rod Petrie has presided over the rapid passing of former Hibs stalwarts John Collins who walked out, Mixu Patalainen and John Hughes. Searching questions have been asked of Petrie, his board and their selection process which has allowed this state of affairs to occur. I for one am still questioning that process and the confines with which the men in charge at The Holy Ground impose upon it. For many months Hibs have been a shambles on the pitch, in stark contrast to the fantastic advances in the infrastructure of the club. Of the latter, the superb new East Stand and outstanding training centre development at East Mains indicate striking progress for the club and I would be one of the first to agree how important these projects were for Hibernian FC’s future and to give credit. Hibs are not a rich club by any means but financial prudence has allowed these developments to happen. It will be said in fairness that the bank balance in Leith is far healthier than probably most professional clubs in the UK. For a club with the modest attendance figures of the men from the Capital that is certainly a great achievement, but at what price? There has to be balance and I feel that the club have not achieved this. For several years the fans have had to stand and watch many, many excellent players being sold off. This in isolation is not the fault of the board as modern footballers have a lot more say about where they ply their trade and Hibs cannot necessarily afford to pay them the salary they can demand elsewhere due to the fiscal framework at Easter Road. A more relevant criticism for me is that none or very little of the funds raised from selling excellent player after excellent player appear to be redirected back towards acquiring new quality replacements to the squad. The same thinking appears to be prevalent when choosing and dealing with new managers. Let’s make no mistake, this position is absolutely pivotal to any football club, it’s the most important individual the club has and I don’t feel that Hibs appear to recognise this judging by their various managerial appointments. There is no significant investment in an individual that could potentially drag the club out of the reach of the rest of the also-rans of Scottish football. It would take bravery, boldness and imaginative thinking for that to happen and the sad thing is that the very innovatory influences the club has been famed for through its 135-year history no longer exist. 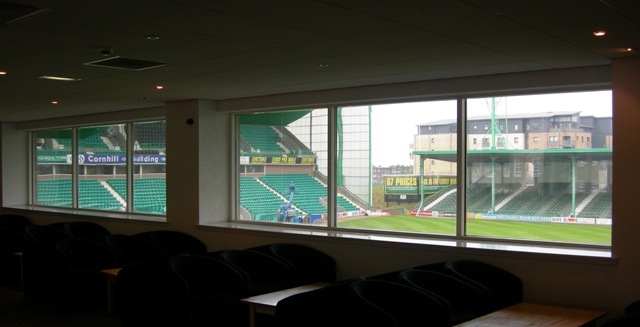 Rod Petrie is an inveterate accountant and whilst his three-column approach to running a football club is admirable in some ways, his occupancy at Easter Road is not characterised by imagination or calculated risk-taking. His leadership is that of an artisan, not an artist, a Roundhead, not a Cavalier. 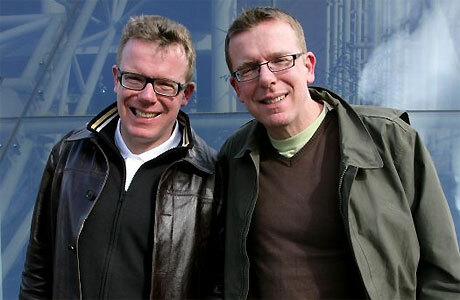 Make your own mind up which is the better ‘fit’ in Leith. Two managers ago, I felt Hibernian fell lucky in appointing John Collins, the former classy and dedicated Scotland midfielder. Collins splits opinion amongst fans radically with the chief criticism being of his mediocre signings. My answer to that is that again, millions of pounds worth of talent was sold from under him. Fair enough, it had to be, but it’s apparent that peanuts were given back to him to replace those players and guess what? The inevitable happened in spite of Collins insistence on discipline, dedication and trying to play the game the way it should be played. His forward thinking ideas were diamonds in a rough sea of mediocrity. The well-documented player revolt against his methods was seen to be most feebly backed by the board and Collins, realising he was kicking against the sticks at Easter Road gave in to the small-minded and penny-pinching thinking at the club and unexpectedly walked. A sad day in my view and a real opportunity lost. The above are just a few of the comments I picked up on the Internet after Hibernian’s 1-0 defeat at rivals Dundee United yesterday. It should be said that others held a more pragmatic view of the current state of Hibs however and that these were the angry remarks of post-game supporters. The game was a genuine four-pointer that’s for sure. To compound the disappointment, an opportunity to gain gain ground on Celtic who dropped two points at home to Falkirk was lost.